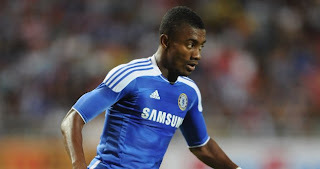 Paris Saint-Germain are trying to secure a deal for frustrated forward Salomon Kalou. The Ivorian has failed to nail down a regular starting place at Chelsea since joining from Feyenoord in 2006, and with his contract set to expire at the end of the season, PSG are looking to offer him a way out. The French giants have the financial muscle to compete with Europe’s elite and a move to PSG could be an attractive proposition for Kalou. Former Chelsea midfielder Claude Makelele is now a sporting advisor at the Parisian club and he reportedly spoke at length about Kalou joining the club with Alain Roche, PSG's recruitment chief, during the Blues’ game with Valencia.